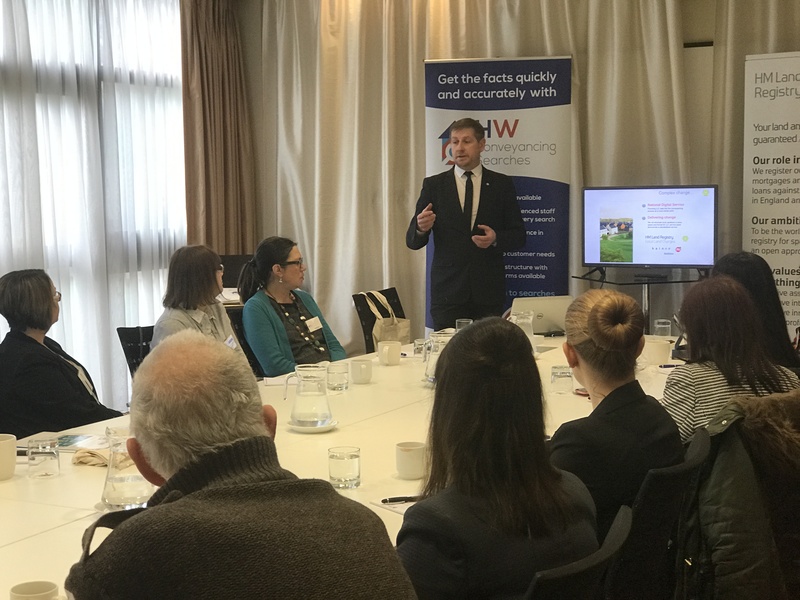 On 10th January, I travelled down from Nottingham to Portsmouth to attend and present at a property seminar hosted by HW Conveyancing searches (HWCS), an event that brings together Conveyancers from the Portsmouth and Southampton area. The seminar took place in the conference room at the Marriott Hotel on the outskirts of the city, and attracted 20 delegates from 8 firms all interested in the latest updates from HM Land Registry (HMLR). These seminars are an opportunity for HMLR to showcase the new digital Local Land Charges (LLC) service which is currently under development, a central, digital service for LLC which will consolidate local authority registers into a single register. I have to get to the hotel early to set up the TV Monitor, Lap Top and ensure that the demo of the register service and search a charge service are working. Not forgetting a quick coffee and a glass of water to guard against the dreaded coughing fit! The seminar starts off with an introduction from HWCS managing Director, Andrew Prismall who then talks to delegates about the products and services his company offer to conveyancers. This is followed up by an introduction to the HMLR representative who at this event was me. I have a two-hour slot on the agenda and HMLR is described as the main attraction. I have been described as many things over the years but this makes me very proud to represent us! The first part of my presentation is all about LLC and includes an overview of the progress made during the last year including building the LLC register by our teams in Plymouth alongside our register services partner Kainos. The main part of this session is a demonstration of the new register service. Delegates are really impressed with how easy it is to order an official search and love the fact that it shows the charge extent. However, they save most of their praise for the free repeat search option. After the mid-morning break, the presentation continues with a session on how HMLR and conveyancers can work together to improve the quality of applications submitted and therefore avoid requisitions. There is always a really lively debate and I acknowledge that HMLR also have to be more consistent in how we process applications and raise requisitions. The two-hours fly by and we end with a really interactive Q&A session. Finally, we finish off and join delegates for a quick lunch where the discussions continue over a sandwich and more coffee. At the Portsmouth event, we are able to provide a positive update on progress of LLC and sign up six volunteers to participate in user research and focus groups. One large customer also request a meeting for us to present to their colleagues and senior partners. All that is left is to pack away the equipment, say our goodbyes until next time and start the long journey back to HQ in Nottingham and a restful evening on the sofa! For us, these seminars and the Local Law Society events provide a great opportunity for us to speak to HMLR customers as we are designing, developing and delivering digital products and services. It is also an opportunity to share our knowledge and learning particularly as we share a common goal to improve the conveyancing process. Thank you again Jamie. A great day!